How things look at the beginning of the Senate 2014 campaign. Since Orman will likely caucus with the Dems, and they have the tie-breaking vote from the Vice-President, the Reps have to take two more seats than they have in the above map. Most likely, this would be two from the undecided states, Kansas (Orman), or one or more of the three light blue states (less likely). Screenshot from the latest Congress Infinity internal. When do you expect to release the early test-release? No ETA right now. I would like to see the early test-release next week. This makes me absolutely ecstatic! The only quibble I have: Alaska has both polled and rated more closely all cycle than Arkansas (even though, obviously, both are competitive). 1. What’s going to happen in regards to Louisiana, and the strong possibility there will be a runoff? 2. If Orman wins in the game is it calculated into the Democratic majority? Surrogate suggestions for the Republicans. This list is based on popular Republicans who campaigned for a candidate in the primary and beyond. This list is what I can think of at the moment. 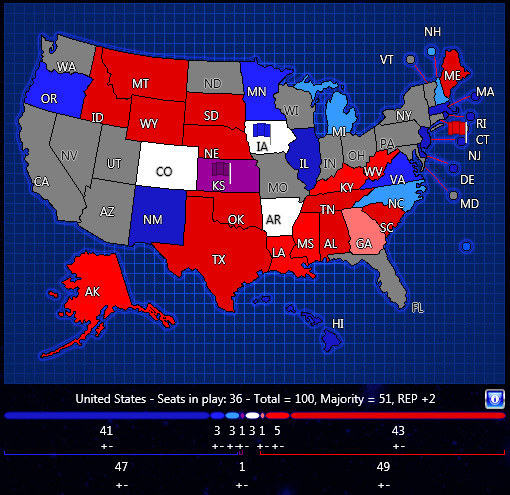 Although, I am interested in how the three-way SD race is calculated? The Dems latest ad-buy (pummeling Rounds but not boosting Weiland ’cause they don’t seem to mind whoever wins) suggests that they think Pressler may caucus with them (and he did endorse Obama twice). Let me also state that I thought the original Congress Forever fundraising aspect was extremely weak. Basically, the only way to raise money was to hit a button and Democrats and Republicans alike were able to raise the same amount each turn. I think fundraising need to be revamped in expanding the possibilities of doing so. To me, the only thing to do is decide where you allocate your resources. Where I think fundraising plays a bigger/equal aspect in reality. Basically, it should be more than pressing a button every turn. I agree- fundraising aspects should be expanded in Congress Infinity. Is there a Governor Infinity? That would be good, if there was a way of making it that winning a region (county in this case) wouldn’t mean winning a seat necessarily. I hope there’s a way of doing that. Thanks for this – polling numbers may be tweaked before release. 1. Initially, Louisiana will be treated as a simple FPP. 2. Orman is treated as an Independent. It seems likely he will caucus with the Dems, and he might be set as in a ‘coalition’ with the Dems (which means their numbers are added together when determining whether a party has met its goals). Pressler will also be an Independent. Similar considerations apply as with Orman. Ya, fundraising ought to be expanded. We’ll see. No Governor Infinity at this point. When’s CF going to be released to Steering Council? No official ETA yet, but my aim is this week. While I agree the AK and LA are leaning red, I wouldn’t go so far as coloring them in as ruby red states. They’re both 4-5 point races and would consider them “leaning Republican,” or light red, especially since both races feature incumbent Democrats. Thanks for this – we might tighten them up a bit.